It’s a fairly sure bet that when the government is sued for infringement of intellectual property, the government will win. 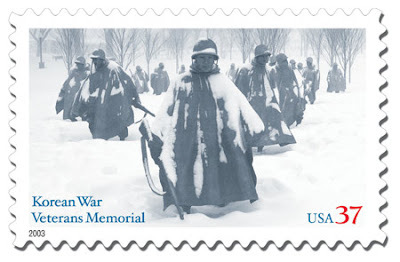 In Gaylord v. U.S., the Postal Service was accused of infringing the copyright in the statues of soldiers that are part of the Korean War Veterans Memorial, by using them on a stamp. The Court of Federal Claims held that Gaylord was the owner of the copyright in the statues, but with some very generous reasoning the court found that it was a fair use. The copyright ownership of the statues was a matter of some contention from the beginning. The parties to the contract could not initially agree on ownership, but ultimately CLA and Gaylord entered into agreements which said that Gaylord was the sole owner of the copyright, and which included a royalty schedule. There is some mention in the case that the government demanded ownership, but that the government “had suddenly withdrawn their claim for copyright ownership and/or royalties received from same.” Gaylord later terminated the agreements, claiming that CLA had breached them. Gaylord also registered the copyrights in the works at various stages and times. John Alli took a photograph of the statues in the snow as a gift for his father. The photograph won a photography contest and was featured on the cover of the Naval Institute’s “Proceedings” magazine. When Alli wanted to sell reproductions of the work, he contacted CLA and was told that it owned the copyright “outright.” Alli agreed to, and did, pay a 10% royalty to CLA on his sales. The Postal Service paid Alli for his rights. Alli told the Postal Service that it would need permission from the owner of the copyright in the statues, referring the Postal Service to CLA. The Postal Service did not get permission. The government was smart enough not to make the always-futile argument that The Column was a work made for hire. Instead, it argued that it was a joint owner of the work. 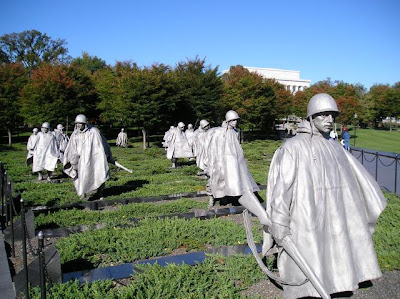 The government claimed that various different participants made contributions to the sculptures: background stories for the soldiers, whether they should wear ponchos, and various other changes to the models for the statues. But the court held that these were suggestions and constructive criticisms, not evidence of contributions to joint ownership. Moreover, the parties never intended to create a joint work – the agreements, although terminated, showed that the parties agreed that sole ownership was Gaylord’s. The artistic expression of “The Column” can be summarized as a three-dimensional sculptural snapshot of a group of solders on an undefined mission during the Korean War, captured as a single moment in time. Mr. Alli, though his photographic talents, transformed this expression and message, creating a surrealistic environment with snow and subdued lighting. The viewer experiences a feeling of stepping into the photograph, being in Korea with the soldiers, under the freezing conditions that many veterans experienced. Mr. Alli took hundreds of pictures of “The Column” before he achieved this expression, experimenting with angles, exposures, focal lengths, lighting conditions, as well as the time of year and day. Mr. Alli also achieved his vision using various photographic effects and equipment. Mr. Alli’s efforts resulted in a work that has a new and different character than “The Column” and is thus a transformative work. The Postal Service further altered the expression of Mr. Gaylord’s statues by making the color in the “Real Life” photo even grayer, creating a nearly monochromatic image. This adjustment enhanced the surrealistic expression ultimately seen in the Stamp by making it colder. Thus, the Postal Service further transformed the character and expression of “The Column” when creating the Stamp. In my book what this describes is two derivative works, not a transformative use. I’m in the school that the “transformation” in the fair use analysis refers to whether the second work has a different use and purpose than the original, not how far removed the second is from the original (which instead goes to substantial similarity). See Laura A. Heymann, Everything is Transformative: Fair Use and Reader Response (SSRN link here). The Postal Service’s use of many of the statues weighs against fair use. This fact is somewhat mitigated, however, by the quality and importance of the statues to the Stamp. . . . Mr. Alli and the Postal Service used variables to lessen the quality and importance of “The Column” and to alter the expression of the Stamp. Mr. Alli used the snow covering the statues as a tool to obscure the statues and create a heightened surrealistic effect. He added to this effect by sharply reducing the color of the statues through controlled lighting. The Postal Service reduced the color even further when producing the Stamp, creating a nearly monochromatic image. The efforts of Mr. Alli and the Postal Service this changed the qualitative message of “The Column” and mitigated the weight of the third factor. Finally, on the effect of the use upon the potential market for or value of the copyrighted work, the court blew past the fact that the Gaylord-CLA agreement contemplated and made a valuation of royalties, and that the Postal Service routinely pays for the right to reproduce images on stamps (as it had to Alli). Instead, the court noted that Gaylord hadn’t successfully commercialized his copyright and that stamps aren’t a commercial substitute for Gaylord’s future products, weighing the factor in the government’s favor. The classic split the baby maneuver, ownership of the copyright to Gaylord but noninfringement to the government. Gaylord v. United States, No. 06-539C, 2008 U.S. Claims LEXIS 357 (Ct. Cl. Dec. 16, 2008).